Of course Fiona had to return. She's been in probably about four other posts. She was even posted on here the other day. It was Tuesday, if I'm right. She's smiling because her kibble is so lip smackin' good! Take note of the closed, squinty eyes. Her snout it nice and long. She's got the ears of a Pit Bull. Her body is long, along with the tail, because of the Dachshund in her blood. 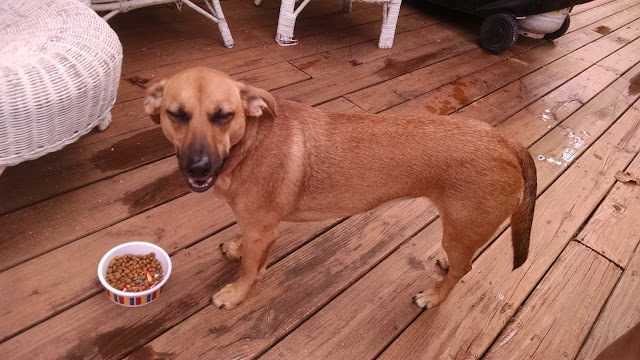 There's nothing a Doxie mix loves more than a nice fresh bowl of food to chow down on!